I’ve been a long-time Diptyque lover and many of you have seen that their candles and fragrances are a huge part of my everyday life. This post has been highly requested as many of you ask me for recommendations on a regular basis. I think fragrance shopping can be overwhelming if you’re new to the line or don’t have in person access to smell their products. When I first discovered Diptyque it was hard to find – only a few stores carried it and they were at least a 2 hour drive away from where I lived. Sometimes it took me several trips that happened over a few months before I could decide to splurge on one. You know the drill – sometimes you have to smell something and think about it before deciding whether or not to buy a scent whether it’s perfume or for the home. In the past 5 years they’ve expanded their offerings to more retailers which I’m thrilled about and have also opened up quite a few new free standing boutiques. I thought it was time I did a roundup of my favorites and a mini guide on the brand in case you’re new to the line and want some ideas of where to start exploring. For me fragrance is seasonal and home scents are no exception. I’ve tried to include non-seasonal launches that will work for right now (spring to summer). Diptyque occasionally launches limited-edition seasonal options typically in the spring with a rose-theme (the latest one was Rosaviola) and also options during the holiday. In terms of home fragrance brands in general, my favorite lines of the moment include Diptyque, Henri Bendel and Byredo. I do enjoy items from Malin + Goetz, Cire Trudon, Le Labo and Jo Malone as well – but my most-burned candles are hands down from Diptyque. Fragrance preference is so personal and for me Diptyque remains at the top of my list for adding a special touch to the home. I find the scents to be beautiful and love how well designed the packaging is. I love the way they burn and how the scents can lift one’s mood. I truly think they are worth the splurge. Up first is a breakdown of the standard scent options and sizes. Shown below from left to right are the standard options you can buy individually. Standard scents are split into categories like Fruity, Woody, Spicy, Herbal, and Floral. Most of the scents can be easily found at a wide range of retailers. You can also find the Collection 34 options at most retailers too. These come in a slightly different jar that is a matte porcelain jar currently available in 3 options (all shown in this post here, also priced slightly higher than the standard options). Also shown below is a pair of the Wick Trimmers which I’ve found invaluable in trimming and catching burnt wicks. They can be found at all Diptyque retailers. Photophores are decorative accessories and come in several options. For the most part these are exclusive to the boutiques. Here’s a quick snapshot I took of the glass options lined up in Printemps when I visited Paris last year. They are on the pricey side but they make beautiful decorative accents for the home. In recent holiday seasons they’ve started offering the Large Photophore + Baies or Large Photophore + Feu de Bois as a set (one with straight lines) at multiple retailers. If you’re curious on which ones I own, I have the Large Full Twist (shown here), Small Full Twist (shown here) and Oiseaux Photophore (shown here). Eau de Sens (c/o) is the newest fragrance from Diptyque. It’s the best orange blossom I’ve found that works with my chemistry. Most turn too sweet or have a bitter dry down, this is just perfect as an in between kind of scent. It has orange blossom, bitter orange, juniper berries, angelica and patchouli. Florabellio (c/o) was last spring’s launch and to this day it’s one of the most unique scents I own. It’s description makes me think it would be the last scent I would ever wear as it has a mix of apple blossoms, apricot, fennel, sea salt, coffee and toasted sesame. It’s sweet and summery. Where is the best place to buy Diptyque? You can find these at a wide range of retailers. My preference is to shop in the free-standing stores/boutiques because they have the best customer service in my experience and also have the widest selection. Since I don’t have one near me though I also order online from Nordstrom and Space NK. I’ve never seen them go on sale, although they do offer occasional gift with purchase minis, these are unfortunately hard to find. Check Nordstrom during their Double or Triple Points Events, Neiman Marcus during their Incircle or Beauty Weeks, individual free standing stores often have promotions too. I’m going to be buying my first Diptyque candle? Which one should I start with? Oooh, tough one! 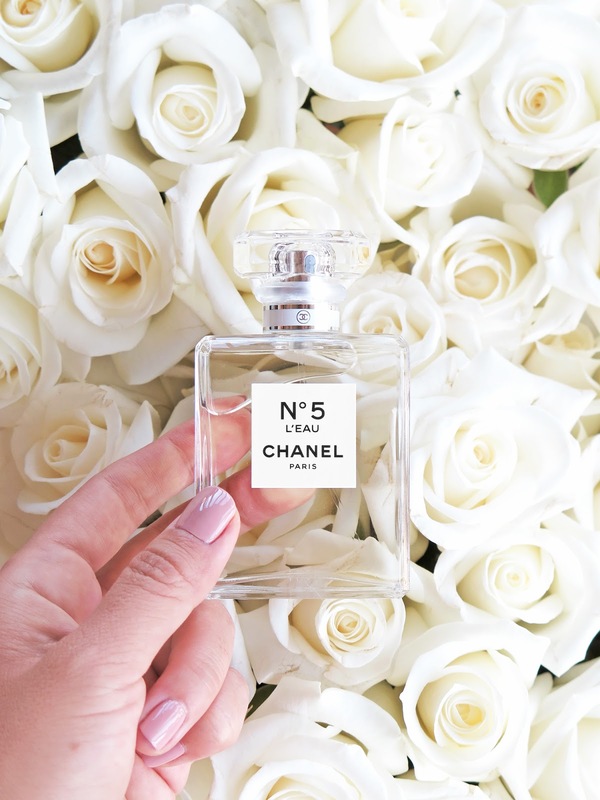 I would say that it really depends on what kinds of scents you like but the three I’ve gifted the most frequently include Baies, Figuier and Roses – I don’t think you could go wrong with any of these. You might want to consider the Mini Candle Trio to start. Some retailers still have the 10 Piece Holiday Candle set from the holiday season too. How long does a candle last? For me a standard candle can lasts months – I don’t know why but it takes me forever to finish burning a candle! Notes on burn time near the top of the post next to each sizing. I haven’t actually timed the burn time from start to finish though. Are there any tips on how to care for candles? Yes, lots of tips in my Candle Care Tips post – be sure to trim the wicks after each burn, also note the timing of the first burn is important to make sure you avoid tunneling. The sides of my candle start burning and turn black with the residual burn, is this normal? Sometimes wicks can migrate so you need to push them back to the center if they start to move. Be sure you trim the wicks before you burn – having long wicks can make them smoke and burn the sides. Is the wick trimmer worth the price? Yes I do think it is. You can use regular scissors or nail clippers or anything sharp to cut the wick too – but it is nice to have a dedicated tool so the wick doesn’t smudge other things you have. The beveled tip also makes it nice to catch the trimmed portion. Is there a difference between shopping at a retailer like Nordstrom or Space NK vs shopping at the individual stores? Yes – individual stores have exclusives, offer beautiful gift wrapping and often have promotions that larger retailers don’t. In my experience the staff at Diptyque stores are very knowledgeable, friendly and I’ve never felt pressure to buy. I’ve done a few stories on boutiques including South Coast Plaza (Costa Mesa), Maiden Lane (San Francisco), Larchmont (Los Angeles), 34 Boulevard Saint Germain (Paris). What about their body products? Any thoughts on those? I really love their Revitalizing Shower Gel for Hair and Body (reviewed here) but it’s so pricey I haven’t been able to bring myself to keep replenishing. Best way to clean out residual wax once the burn is finished? There are a number of different ways to remove remaining wax. I have a tutorial in my Diptyque Candle Jars Recycled post. My favorite way is to use warm water and dish soap in repeated steps to soften the wax and help clean the edges. Although others recommend freezing or boiling, I wouldn’t recommend those methods which I find can make the glass prone to cracking or can damage the sticker labels. What do you do with all the empties? I recycle or repurpose most of them! You can use them to store pens, makeup brushes, beauty minis, roller-ball perfumes, q-tips, etc. 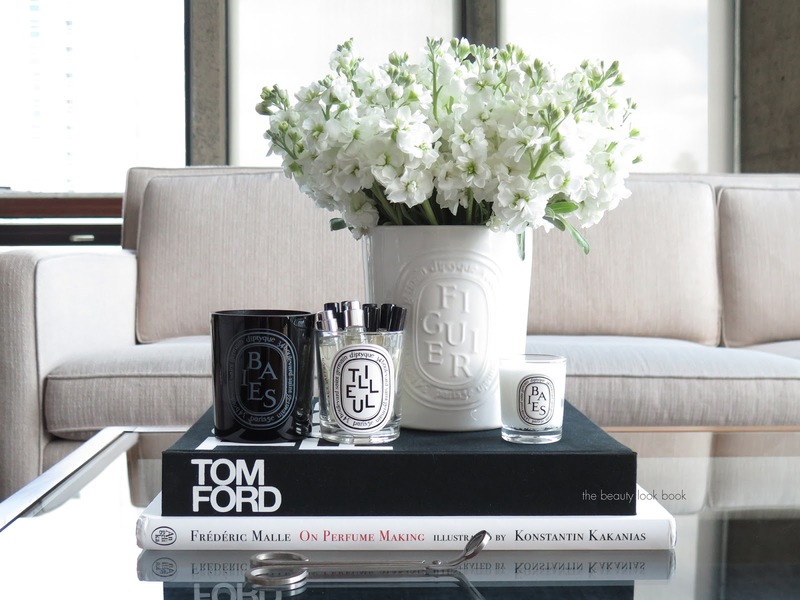 I hope you found this round up guide on Diptyque helpful! I’ve been a fan for years and still haven’t tried every scent they have. For me everytime I visit a boutique I learn something new. I’ve tried a lot more than I’ve featured in the recommendations above but as a starting point I wanted to share the ones that were my absolute favorites. I get asked on a weekly basis what my top picks are and I think there is so much to explore and preferences depend on the season, but if I were to narrow down my top five favorites right now, they would include Baies, Figuier, Cuir, Gingembre Room Spray and Tomas Maier Palm Beach. You can find Diptyque at a wide range of retailers these days. I’m always thrilled when I find they’ve expanded their distribution because it makes it easier for me to find. 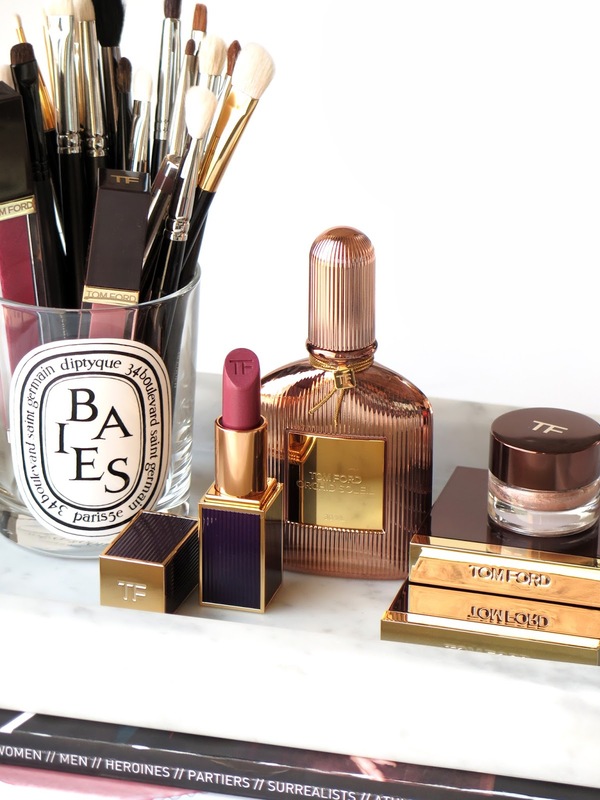 Available at Nordstrom, Space NK (special TBLB promo code valid through May 1st), Neiman Marcus, Saks Fifth Avenue, Barneys New York, Net-A-Porter and Diptyque. Most items featured purchased by me.